FOX: LUCIFER (0.8) and THE RESIDENT (0.9) each dropped 0.1. CW: SUPERGIRL rose 0.1 to 0.6, but the season finale of VALOR stayed at 0.2. 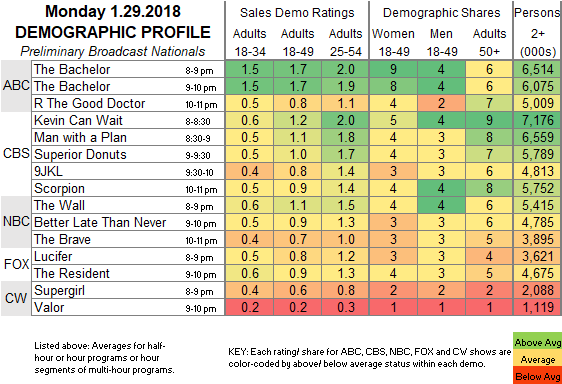 ABC: THE BACHELOR slipped 0.1 to 1.7, and a rerun of THE GOOD DOCTOR followed at 0.8. 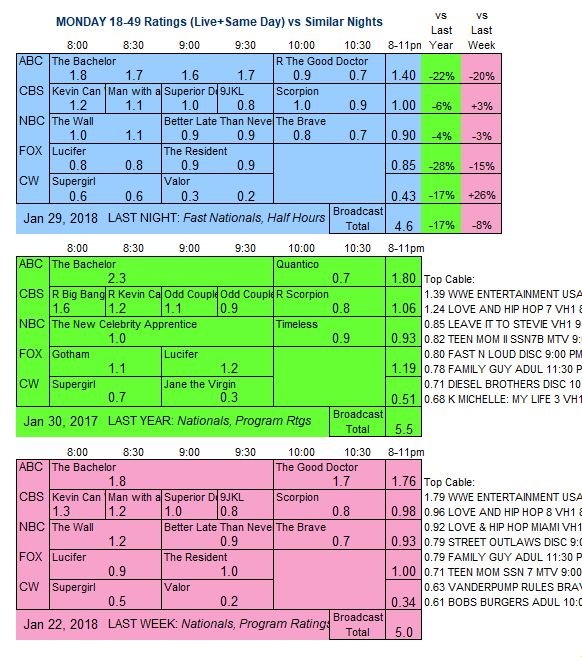 CBS: KEVIN CAN WAIT (1.2) and MAN WITH A PLAN (1.1) were each down 0.1, while SUPERIOR DONUTS (1.0) and 9JKL (0.8) remained steady. SCORPION was up 0.1 to 0.9. NBC: THE WALL lost 0.1 to 1.1, and both BETTER LATE THAN NEVER (0.9) and the season finale of THE BRAVE (0.7) held last week’s numbers. The STATE OF THE UNION address will occupy all the networks 9-11PM tonight, with live comedy coverage afterward on CBS’s LATE SHOW WITH STEPHEN COLBERT and Comedy Central’s THE DAILY SHOW. In the 8PM hour, CBS airs this year’s GREATEST SUPER BOWL COMMERCIALS special, and ABC has back-to-back new episodes of FRESH OFF THE BOAT.